They were all completed and mailed on time, but I'm finally showing you my April, May and June bee blocks. 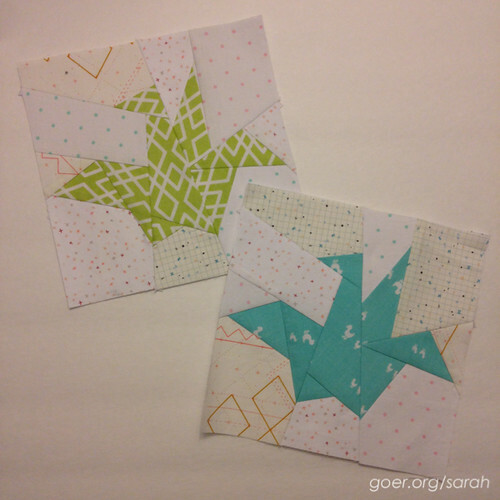 Stash Bee: We made these adorable paper pieced cranes for Liz in April. She was looking for blues and teals, but open to other colors, so I made two. It was a quick and easy block to put together. do. Good Stitches: In April, Diane had us make these simple spool and square blocks in this great color scheme: apple red, dark navy, cream + rain (grayish-blue-greens). I really liked the randomness generated by having each block be any combination of spools and plain squares. Here are my three blocks. The Bee Hive: We made bright and funky Tic Tac Toe blocks for Nicole. We had also made this block in February. It goes together very quickly and I find it easy to be very precise with matching the seams. It was really fun to choose some loud fabrics. Nicole has put together her (soon to be queen size with a border) quilt top with blocks from the bee and about 14 blocks that she made herself. Isn't it so fabulous!? Stash Bee: In May, Hive 1 made Kaleidescope blocks in yellow, lime green, dark teal, red-orange and light lilac for Jackie. I had a great time pulling these fun colors and digging into my low-volume stash. Jackie gave us the option of making a positive or negative block. I decided to make one of each. do. 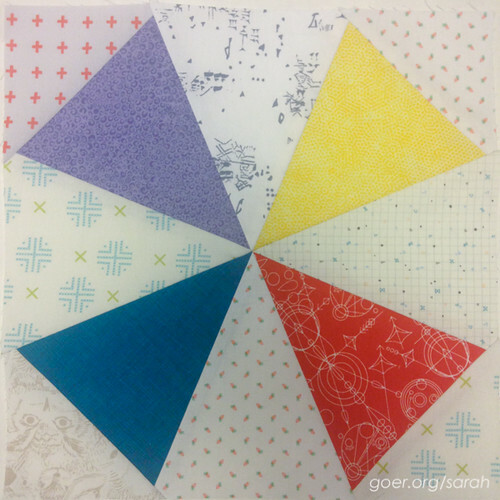 Good Stitches: We made some large scrappy flying geese. The geese measure 4.5" by 8.5" (unfinished). 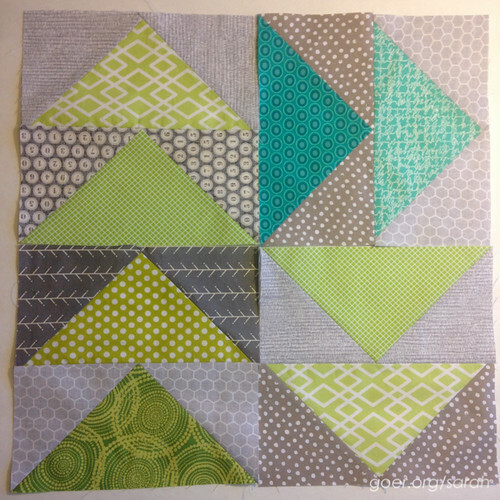 Ailish asked us to use mostly lime, avocado, bright green -- with some turquoise/aqua - on a scrappy gray background. Here's what I came up with for my blocks. 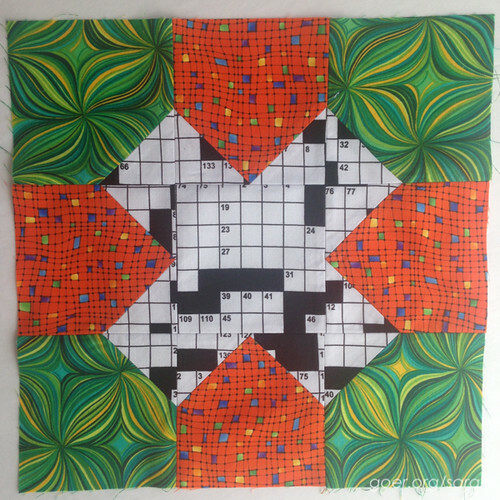 The Bee Hive: In May we made the double star block. Lisa provided us some Essex linen, so there would be some commonality throughout the blocks. This was my first time working with the Essex linen and I think it got me past my fear of cutting into the yardage for my Patchwork City project. 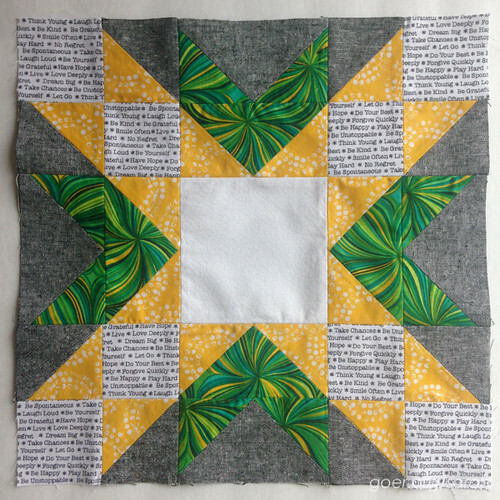 She had admired the green print in my block for Nicole the previous month, so I used it again for her block. 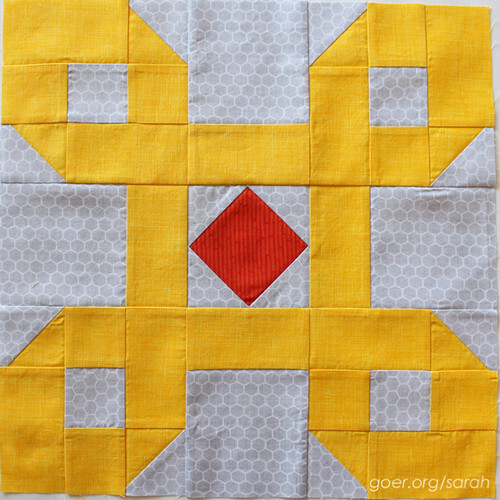 Stash Bee: In June we made this Loopy block for Leo. She was great with her specifics of what she wanted and didn't want for fabrics. The size of the block surprised me when I started cutting fabric. I knew it was 16", but 16" is big. I really like the graphic, geometric pattern and look forward to seeing how Leo sets the blocks. 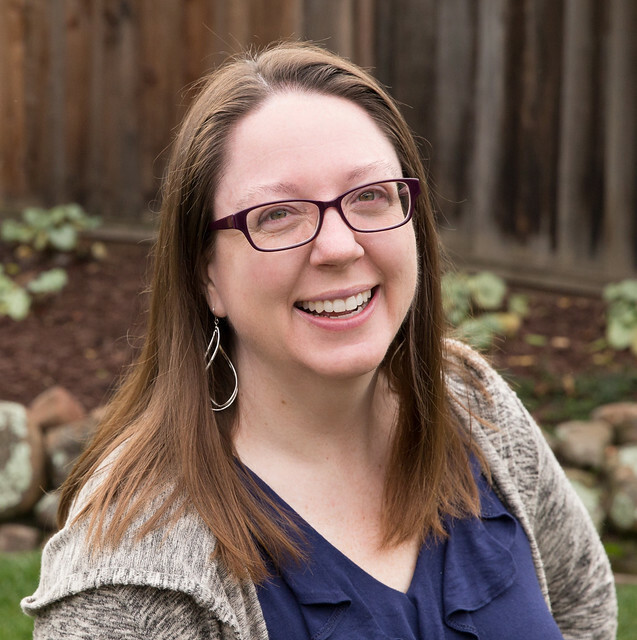 The Bee Hive: For June, we made Wanta Fanta block. 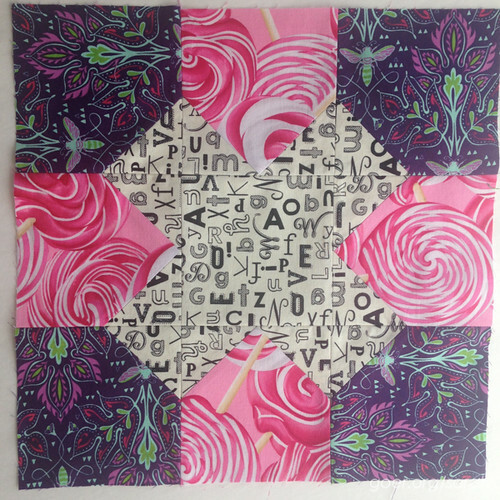 I had a great time putting this together, because I used 34 different fabrics in this 12" block. Kylie didn't want blenders (which is the majority of my stash), so I had to rifle through my scrap bin to find stuff to use. Overall, I was pleased with how this came together. I could totally see using the pattern in the future. I love the illusion of curves it creates when many blocks are put together (and you get a little distance from it). Posted in Quilting. Tags: bee blocks, do. 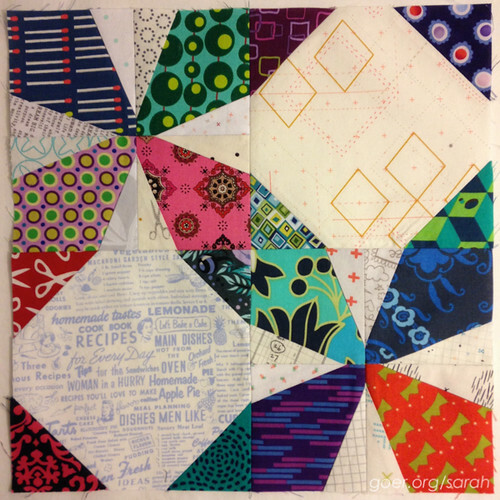 Good Stitches, sewmystash2015, Stash Bee, The Bee Hive on July 12, 2015 by sarah. 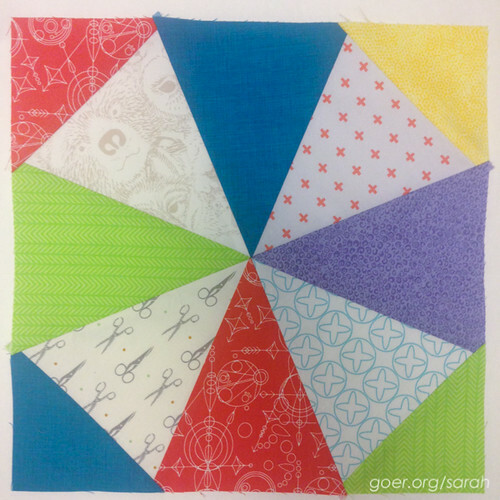 There are some really awesome blocks here, Sarah, and I love getting to see a pieced quilt top - that is super exciting to see the group work come together! Thank you, Yvonne. I'm so glad to have joined the bees this year. Its so fun! And I really love seeing the finished quilts/tops. I hope to be able to share some more of them in the coming months, including mine! 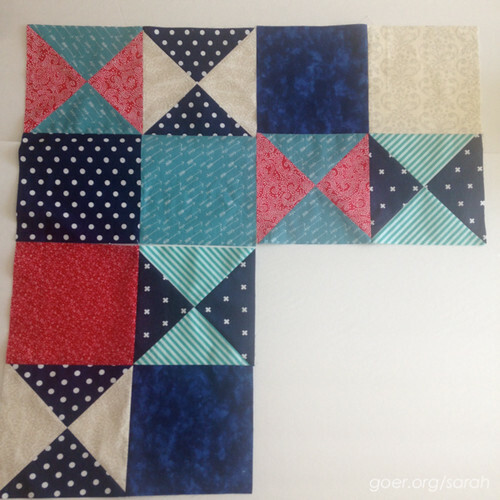 I agree Sarah, you have made some amazing blocks and all such lovely fabrics. What a great idea to put the whole quarter worth of Bee blocks in a post. It definitely makes for an interesting read. 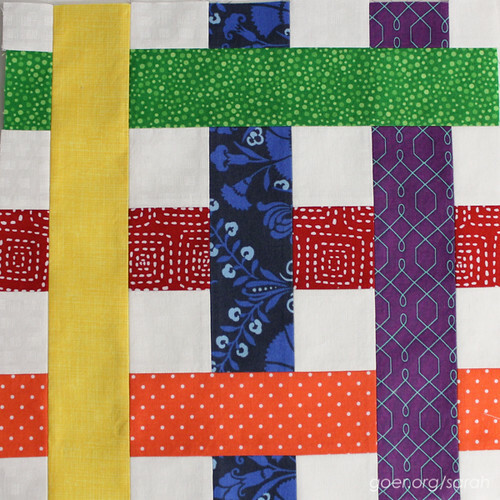 The crane blocks are just so cute...love all the rest as well. They are really fun. I think her project will be adorable with them all put together. Thanks for visiting. Wow, you do a lot of bee work! I'm impressed - lots of fun stuff to see! Thanks, Carrie. I'm having a lot of fun. I think three bees is working out nicely for me. I love the variety of blocks each month. I'm always excited at the beginning of the month to see what pattern and colors I'll be working with. A gallery of bee blocks would be lovely to see. Maybe it should be called a swarm of bees? I hope you'll be able to share a gallery of finished bee quilts too. Swarm of Bees! Cute! I'll definitely think on this. Thanks for visiting, Allison.